AL Anniston Wellness Center of Anniston Jose M. Oblena, M.D. AR Little Rock Arkansas Center for Physical Medicine and Rehabilitation Linda Bunch, M.D. AZ Tuscon Coyote Healing Center Lewis Mehl–Medrona, M.D. CA Danville MTO Holistic Health Center Inc. Marjon M. Fariba, M.D. CA Fresno Patrick A. Golden, M.D. Patrick A. Golden, M.D. CA Long Beach Casdorph Clinic Herman R. Casdorph, M.D. CA Napa Phoenix Wellcare Phoenix Wellness Group Eleanor Hynote, M.D. CA Santa Monica Vitality & Longevity Medical Inc. Douglas J. Hopper, M.D. CA Santa Rosa Gordon Medical Associates Eric Gordon, M.D. CO Denver Frontier Medical Institute Terry A. Grossman, M.D. CT Orange Center for the Healing Arts PC Robban A. Sica, M.D. FL Altamonte Springs Mueller Institute for Functional Medicine & Research Jeffrey Mueller, M.D. FL Bradenton Integrated Healing Arts Timothy W. Blend, M.D. FL Brandon Wellness Works Inc. Carol L. Roberts, M.D. FL Englewood Alternative Health Center Larry Lee Smith, D.O. FL Fort Walton Beach Hyperbaric Medicine Inc. Albert E. Zant, M.D. 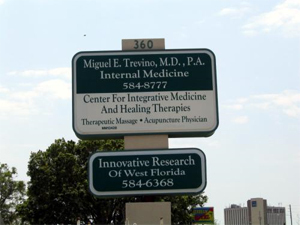 FL Largo Innovative Research of West Florida Miguel E. Trevino, M.D. FL Melbourne Tru Med Ed Rajiv Chandra, M.D. FL Miami Beach Caring Cardiology Roy Heilbron, M.D. FL Miami Springs Pain and Healing Center Angelique Hart, M.D. FL Mount Dora Tri–Health Alternative Medical Center Jack E. Young, M.D. FL North Miami Beach Dayton Medical Center Martin Dayton, D.O. FL Tequesta Tequesta Family Practice Raymond J. Oenbrink, D.O. FL The Villages Life Family Practice Center Nelson Kraucak, M.D. GA Fort Oglethorpe Full Circle Medical Center Charles C. Adams, M.D. IN Goshen Crossroads Healing Arts LLC Tammy Born, D.O. IN Lafayette Innovative Medicine Charles Turner, M.D. IN Indianapolis Advanced Medical Care & Spa Dale Guyer, M.D. IN Plymouth Center for Health Enrichment David Krizman, M.D. IN Seymour Integrative Medical Center at Schneck Medical Center Steven H. Windley, M.D. KS Kansas City University of Kansas Medical Center Jeanne A. Drisko, M.D. KS Park City Park City Medical Center George Watson, D.O. KS Witchita The Center for the Improvement of Functioning International Bright Spot for Health Ron Hunninghake, M.D. LA Baton Rouge Family Complimentary (sic) Medicine / Karen C. Dantin, M.D. Med Cln LLC Karen C. Dantin, M.D. LA Lafayette Wellness and Longevity Center of Louisiana Sangeeta Shah, M.D. LA Mandeville Complementary Medical Services James P. Carter, M.D. LA Metairie Complementary Medical Services James P. Carter, M.D. LA West Monroe Northeast LA Anti-Aging and Wellness Center Linda Bunch, M.D. MA Cambridge Marino Center for Progressive Medicine Guy F. Pugh, M.D. ME Portland Maine Integrative Wellness Sean McLoy, M.D. MI Flint The Preventive Medicine Center Kenneth Ganapini, D.O. MI Grand Rapids Born Preventive Health Care Clinic Tammy Born, D.O. MI Kalamazoo Parchment Family Practice Eric Born, D.O. MI Rochester Hills Rochester Center for Healthy Living Catherine Waller, M.D. MO St. Louis Preventive Medicine Varsha Rathod, M.D. NC Asheville Asheville Integrative Medicine James Biddle, M.D. NC Charlotte Center for Wellness Mark O'Neil Speight, M.D. NC Cornelius Advanced Concepts in Medicine Rashid A. Buttar, D.O. NC Tryon Integrative Medical Associates, PLLC Connie G. Ross, M.D. NE Atkinson West Holt Medical Clinic Robert Randall, M.D. NE Omaha The Camelot Foundation Richard M. Fleming, M.D. NJ Cherry Hill Magaziner Center for Wellness Allan Magaziner, D.O. NJ Collingswood Integrative Family Medicine Our lady of Lourdes Medical Center Ronald Ciccone, M.D. NJ Denville The Institute of Integrative Medicine Majid Ali, M.D. NJ Edison Edison Medical Nutrition Center Richard B. Menashe, D.O. NJ Roselle Park Yulius Poplyansky, M.D. Yulius Poplyansky, M.D. NJ South Amboy Longevity Medical, PA Ivan Krohn, M.D. NJ Stockton Stockton Family Practice Stewart Freedenfeld, M.D. NJ Woodbridge David Strassberg, M.D., P.C. David Strassberg, M.D. NY East Meadow CC Medical Service PC Christopher L. Calapai, D.O. NY Glen Cove Linchitz Medical Wellness PLLC Michael Linchitz, M.D. NY New York Patients Medical PC Rashmi Gulati, M.D. NY Rhinebeck Rhinebeck Health Center Kenneth Bock, M.D. NY Suffern Schachter Center for Complementary Medicine Michael Schachter, M.D. OH Bluffton Celebration of Health Center Louis Terry Chappell, M.D. OH Canton Lake Cable Medical Center Jack E. Slingluff, D.O. OH Dayton Matrix Clinic Lisa Lichota, D.O. OH Grove City Advanced Family Medicine James C. Johnson, D.O. OH Richmond Hgts Dr. Casselberry's Integrative Health Center Ronald B. Casselberry, M.D. OH Toledo Comprehensive Heart Care, Inc. James Roberts, M.D. OK Broken Arrow Wright Health and Wellness Center Robert J. Wright, M.D. OK Jenks Jenks Health Team Gerald D. Wootan, D.O. OR Bend Chris Hatlestad, M.D., PC Chris Hatlestad, M.D. OR Portland Center for Environmental Medicine Chris Hatlestad, M.D. PA Haverford Haverford Wellness Center Domenick Braccia, D.O. PA Greensburg Wholistic Health Center Ralph A. Miranda, M.D. SC Landrum Biogenesis Medical Center Theodore C. Rozema, M.D. SC Myrtle Beach Advantage Health Center, LLC Donald W. Tice, D.O. TN Athens Athens Surgery Clinic H. Joseph Holliday, M.D. TN Johnson City The Castle Clinic Robert C. Allen, M.D. TX Austin Lake Travis Medical, PA Jeffrey L. Butts, D.O. TX Houston Longevity Center of Houston Gurney F. Pearsall, M.D. TX Lewisville Grace Medical Association Smart Idemudia, M.D. TX Houston Chelation Centers of Texas Dorothy F. Merritt, M.D. TX Texas City Chelation Centers of Texas Lisa Merritt, M.D. TX Tyler Tyler Total Wellness Center, PA Pieter J. De Wet, M.D. UT Provo Freedom Center for Advanced Medicine William D. Voss, D.O. WA Bellevue The Center for Optimal Health Ann B. McCombs, D.O. WA Vancouver Hope Medical Holistic Clinic Zbigniew M. Grudzien, M.D. WI Eau Claire Bircher Chiropractic and Wellness Center Donald E. Riemer, M.D. WI Wisconsin Dells Waters Preventive Medical Center, Ltd. Robert S. Waters, M.D. WV Morgantown Morgantown IV Therapy Center Thomas Wilshire, D.O. AB Calgary Robert I. Harper, M.D. Robert I. Harper, M.D. AB Calgary Hoffman Centre For Integrative Medicine Bruce Hoffman, M.D. AB Calgary Jeannette Soriano Northwest Vein Jeannette Soriano, M.D. BC Nanaimo Cline Medical Centre John C. Cline, M.D. BC Surrey Zigurt Strauts, M.D. Cosmetic Laser & Vein Clinic Zigurt Strauts, M.D. BC Penticton Dietrich Wittel, M.D., APCT Dietrich Wittel, M.D. NS Port Hawkesbury The Wellness Centre Benjamin Boucher, M.D. ON Madoc Anti–Aging & Family Wellness Clinic Arun Dosaj, M.D. ON Toronto Chelation Centers of Ontario Fred Hui, M.D. ON Toronto Chelox Shmuel Bergman, M.D. ON Toronto Jaconello Health Centre Paul Jaconello, M.D. ON Markham Markham Integrative Medicine John Gannage, M.D. ON Smith Falls Claire Minielly, M.D. Claire Minielly, M.D. ON North Bay North Bay Complementary Jean Aubry, M.D. ON Barrie Satellite Chelation Clinics Fred Hui, M.D. ON Ottawa Seekers Centre for Integrative Medicine Richard Nahas, M.D. SK Saskatoon Saskatoon Chelation Centre E. M. Nykiforuk, M.D. Community Chelation Practice, Community Chelation Practitioner: (Yellow Row) a chelation clinic or institution which, based upon information on its web site, offers chelation in addition to conventional or unconventional health care, or an institution owned by or affiliated with a current or former member of the American College for Advancement in Medicine (ACAM), or the International College of Integrative Medicine (ICIM), formerly known as the Great Lakes Association of Clinical Medicine or the Great Lakes College of Clinical Medicine (GLCCM). Indeterminate: (Gray Row) not possible to determine if chelation is offered from website. Site Name and Website: name of study site or institution with link to website where available. Links are provided for community chelation clinics and indeterminate institutions only. PI or Site Owner: Principal Investigator as identified in FDA Bioresearch Monitoring Information System, Clinicaltrials.gov, NCCAM's lists of U.S. and Canadian sites, or principal (owner) of institution identified in Federal Wide Assurance filed with the Office for Human Research Protections (OHRP). NA: Not Applicable, indicates a trial site that is not a community chelation practice. NB: readers may notice that NCCAM's lists of TACT sites differ from Clinicaltrials.gov. ; we are at a loss to explain this. Readers may also notice the number of sites varies over time, for example in May 2008 Clincaltrials.gov listed 163 sites (http://web.archive.org/web/20080510054328/clinicaltrials.gov/ct2/show/NCT00044213?show_locs=Y#locn); on November 21, 2009 95 sites were listed (http://clinicaltrials.gov/ct2/show/study/NCT00044213?show_locs=Y#locn). Table A includes all TACT study sites that appeared on one or both lists between November 2003 and November 2009. We relied on the Wayback Machine at Archive.org to retrieve previously published web pages of NCCAM and Clinicaltrials.gov site lists. Further information about the Wayback Machine is available at: http://www.archive.org/web/web.php.